Chase BMX frames have been in development for over a year and a half, with the design inspiration coming from one of BMX’s all time greats, Christophe Leveque. Christophe is a 9 time World Champion, as well as winning the ABA #1 Pro title 3 times, the NBL #1 Pro title 2 times, and an incredible 22 time European and French Champion! The frame was designed and refined with Christophe overseeing each step of the process and giving exact direction to ensure the frames are what we believe to be the world’s best BMX racing frames. So with the best BMX frame in the World, we needed one of the best BMX riders to race it. Chase BMX is excited to announce today the signing of our first Elite rider to the brand. On 1/11/11, a 2-year contract was agreed to and signed by Connor Fields. Connor was the top USA Elite rider on the UCI Supercross series in 2010, finishing 3rd overall in the world. He also finished 2010 as the World #1 ranked Junior Elite Rider. “I’m really excited to have signed on with and to be involved with BMX Racing Group for the new, upcoming season. Working with Pete and Christophe is a unique and once in a lifetime opportunity. Not only are they supporting me on the race side, but I am getting to learn the business side of the sport that I love.” Connor said. “Connor has been one of the most promising up and coming riders in the USA and at such a young age, has already proven he has what it takes on the international level at the UCI Supercross events. Having worked with him in the past, I knew he was not only a great rider on the track, but already understands how to give back to the sport and promote himself off the track. When the opportunity to sponsor him arose in early January, we jumped on the chance to sign Connor to our team to what we hope is a very long relationship”, stated BRG Strategic partner Pete Dylewski. 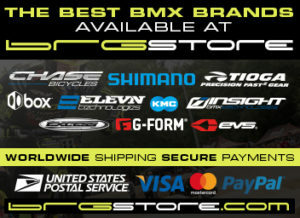 The Chase BMX team already has support from several excellent companies, such as Kicker Audio, Shimano, Insight, Excess, and Elevn. We will announce the full list of sponsors in the very near future. Look for Connor to make his debut on Chase BMX next month at the ABA Oldsmar national event.